We’ve put together the ultimate Australian road trip itinerary. It includes the best drives in Australia and the best Australian attractions. Since becoming nomadic, we’ve done a lot of road trips in the US. Some were for months at a time and we loved them because we got to see so much of the country. Because of this, we’ve recently started daydreaming of what it’d be like to do road trips in other countries. Australia is a country we’ve always wanted to visit. With it being such a large country, however, we’ve always worried that we wouldn’t be able to do it justice if we only flew there for a few days. Granted, if that’s all that is possible because of time constraints, then by all means do what you can. But we’re hoping that one day we’ll be able to visit with more time. So we’ve started putting together an ultimate Australian road trip itinerary. This is us speaking it into existence! Well, writing it into existence. 😉 Obviously nothing is set in stone, but it is a start to what we think would be an epic road trip around the country. Pro Tip: Check out our Road Trip Essentials. First things first: Getting into the country. We need a visa to visit Australia, but luckily it doesn’t seem too difficult to do. We found all of the Australian visa information on this Australian government site. We will also need an international driver’s license to be able to drive in Australia and we need to keep reminding ourselves that Australians drive on the left side of the road. Gotta remember to drive on the left! As far as actually getting from place to place, we’re still undecided. While we were in Montreal we met a couple that bought a car when they got to Australia and went from city to city in it; they slept at friends’ houses, in hostels, or in the car. There’s also the option of buying a campervan; we found some good prices for them on this website. We wouldn’t have to pay for lodging, but would have to consider the cost of camping sites. The weather will also play a factor in some final decisions, like if we travel clockwise or counterclockwise around the country. We’d prefer counterclockwise though. We also have to remember that the seasons in Australia are opposite to what we’re used to in the northern hemisphere (September to November is spring, December to February is summer, March to May is fall, and June to August is winter). After exploring Melbourne, we’d head northeast towards Sydney. We definitely want to stop and go to the southernmost tip of mainland Australia in Wilsons Promontory National Park and also see the fairy penguins on Phillip Island. Visiting Jervis Bay is also a must. This east coast road trip is also known as the Legendary Pacific Coast. It’s considered one of the best Australian road trips and offers visitors beautiful beaches, thrilling adventures, and wineries! One of the highlights of this road trip would be spending time at Byron Bay. There would be many beach stops on this trip. One beach we want to visit before leaving Brisbane is Streets Beach which is actually Australia’s only inner-city, man-made beach. Then off we’d go heading north to Cairns which is considered the gateway to the Great Barrier Reef. The reef is something we’ve wanted to see since we were kids, and we know this would be one of the highlights of our Australian road trip. This road trip from Cairns to Broome is also known as The Savannah Way. With it being more inland, we’ll get to see waterfalls, rock formations, national parks, World Heritage sites, and lots of wildlife. 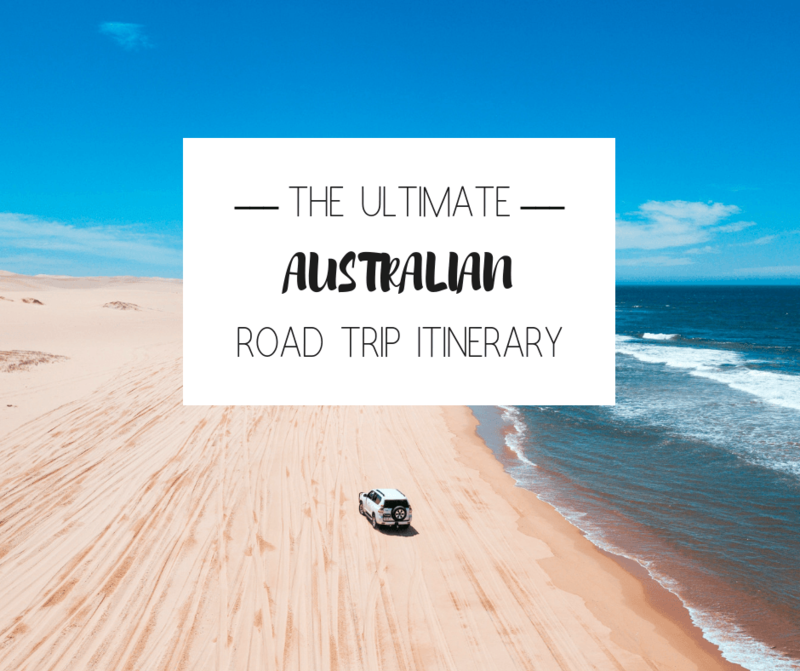 This is one of the longer road trips in Australia, and one with the most incredible landscapes. On this road trip, we’d love to cross off something from our bucket list… swimming with whale sharks! We’ve heard Coral Bay is a perfect place for it. We also would like to visit the Pinnacles Desert. It looks straight out of a movie! It’s time for more wine! We hear the Margaret River wine region produces some great wines. Something else that really draws us to this part of the road trip is the landscape in South Australia. It looks really beautiful. Another one of the best drives in Australia is from Adelaide to Melbourne. There are a few lighthouses that we’d like to see on this road trip, including Cape Otway Lighthouse, the oldest surviving lighthouse in Australia. Of course, the biggest attraction on this drive is without a doubt the Twelve Apostles. Seriously, how incredible would this road trip across Australia be?? And these are just a few of the things we’d want to see, aside from spending time in the major cities. When we’re finally able to travel to Australia, we’ll go much more in depth into planning an exact 3 month itinerary. But for now, this will have to do. A girl and her stuffed monkey can dream, right? Look at that croc. Quite awesome Vicky. And Buddy. Oz has called to us for a minute but after a recent trip to New Zealand we fell in love with that part of the world. Endless list of things to do and see in Australia. Just gotta beware some of dem critters. We are currently uploading YouTube videos of our trip round Australia. Different route from Adelaide to Cairns as we have done that bit many times before. Please feel free to check them out on our website http://www.sherrieandchris.com . Best time to travel top of Australia is July,August,September,October to avoid the wet season and cyclones. Thanks for the tip! We definitely want to avoid cyclones! I am always fascinated by the road trips, i have traveled various parts of Rajasthan in India by car, it is really a great fun. I am sure soon i will travel to Australia and your article will be very useful. Thanks for sharing. Ah, you take such good photos, Buddy – love them all. Thanks for sharing this Australian trip itinerary! This looks like quite an amazing trip itinerary. I have never been to Australia but I would love to go there one day. I’m not sure I would want to drive everywhere, but at the same time, it’s a great way to see plenty of amazing sites and gives you some flexibility on where and when you can go to places.